What better way to start your Wednesday than with a GIVEAWAY?! A friend of mine has an Etsy store and asked me if I wouldn't mind helping her promote it. She has a ton of different items, including custom medal holders, decals, wood signs, wine glasses, etc. I am always in for helping out a friend (because, let's be real, we are all in this life together so we need to spread the love around! ), not to mention personalized gifts are my jam! 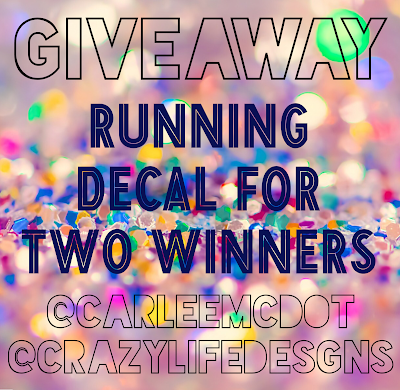 Today's giveaway is for a FREE running decal! You can put it on your car, on a water bottle, on your bathroom mirror, wherever you'd like! TWO WINNERS will be selected, each receiving a running decal of their choice. 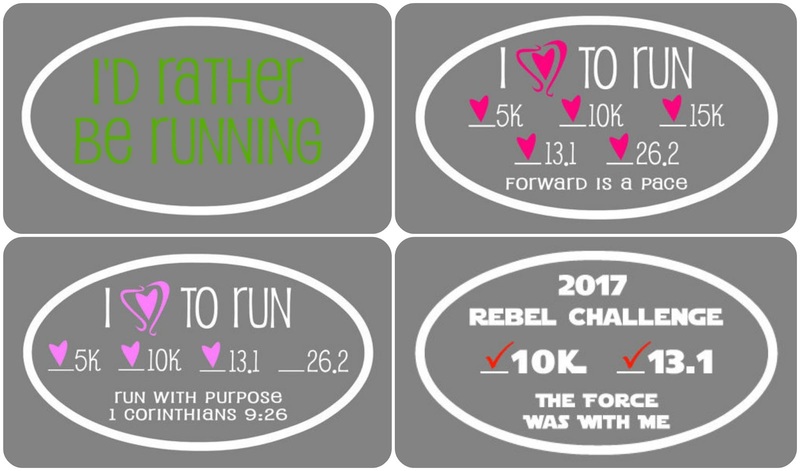 Below are some of my favorite decals (but she has over 35 different designs, so there is something for everyone). I love that you can customize them! If you're like me, you're a list maker and LOVE crossing things off said list. Well, some of these decals allow you to do just that! You pick the heart color and specify race distances. You can even customize the bottom line of copy with a favorite motto, blog name, your name, scripture, or more! Entering is easy, just use the Rafflecopter widget below and put your name in the hypothetical hat. And just in case you aren't one of the lucky winners, I've got some good news... Nanci is offering up 15% off any purchase over $5 with the code "CARLEE2017" - so EVERYONE WINS! 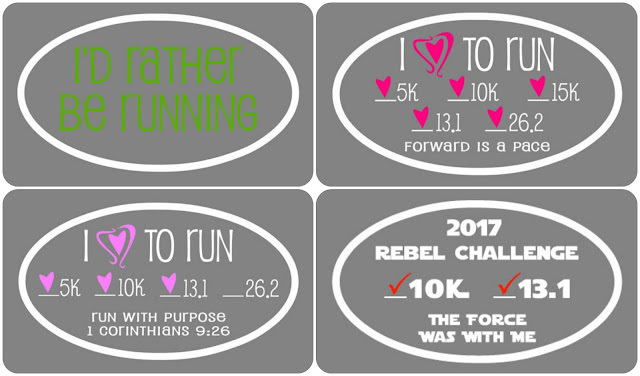 PS The running decals always ship free, so stock up today! This giveaway runs through Tuesday, January 31st at 11:59pm PST. The winners will be contacted via the email address associated with their Rafflecopter account and have 24 hours to claim their prize. All entries are verified, so be sure to complete them or a new, random winner will be selected (I don't want you missing out due to a technicality). Every time I conquer a new distance, I get a magnet for my car! He currently has a 13.1, 26.2, and 19.3 RunDisney magnet for Lumiere's Challenge. Hoping to add a 48.6 Dopey in January 2018, and possibly a 50K later in 2018. I typically save my bibs and medals. I'm attempting to come up with some sort of gallery wall for our bedroom to hang those as well as photos and a cross stitch race portrait I made! I've only done 5ks and one 10k so far. I'm currently training for a half, after that I'll probably get a sticker for my car. I save bibs and medals and if it's a new state I get a magnet from that state to add to our refrigerator. Post on social media and I save my bibs and medals to go on my plaque at home! I have a thing on my wall for my medals and bibs! I feel like I use my medals to celebrate my running achievements. When I corss off a new distance, I do like to get window decals for my car. I enjoy celebrating with my support system! I love being able to celebrate my achievement that was majorly influenced by their support! I wouldn't be able to reach those achievements without them!! I love taking photos with my medal and posting it on social media. Hubby and I hang all of our families running medals in the hallway, so we can see them on a daily basis to remind us of all of our hard work! I normally commemorate a running achievement quietly by myself. Almost no one else around me cares or understands. I hang my medals on a medal rack and I usually do something special to celebrate- a pedicure, shopping, etc! I keep my bib, noting the time & keep a pic of me in my shirt. Since my husband runs them with me, sharing the memory rocks! I normally reward myself with some awesome workout clothes I've been dreaming of.. or food. I love love love that one of the decals has "Forward is a pace" on it. I always remind myself this when I get frustrated about being not as fast as other people. Running may not come easy for me, but what truly matters is I'm running, and I'm loving it (sometimes). I've only run 2 5K races so far & neither of them had participation medals. As I continue on, though, I'd love to get a medal/bib rack to display. These decals are awesome - I love them. Great giveaway. I like to wear my medal the rest of the day and also post pictures to Instagram. I hang my medal up and write my time on my bib. I commemorate a running achievement (which is every time I set out on a run, in my book :) bY posting a picture aND a recap to my running IG page. Ive found it to be a great visual journal, motivational, keeps me accountable and connects me to other runners! I hang all of my bibs and medals on a rack in my living room. I commemorate each race by going out and getting a delicious craft beer to celebrate! Life is short, so why not enjoy a good beer here and there. I have not really taken up running but I would like to. Away to commemorate a run for me would be to share the win with family and friends. I hang my medals and bins- they're a visual reminder of my journey.